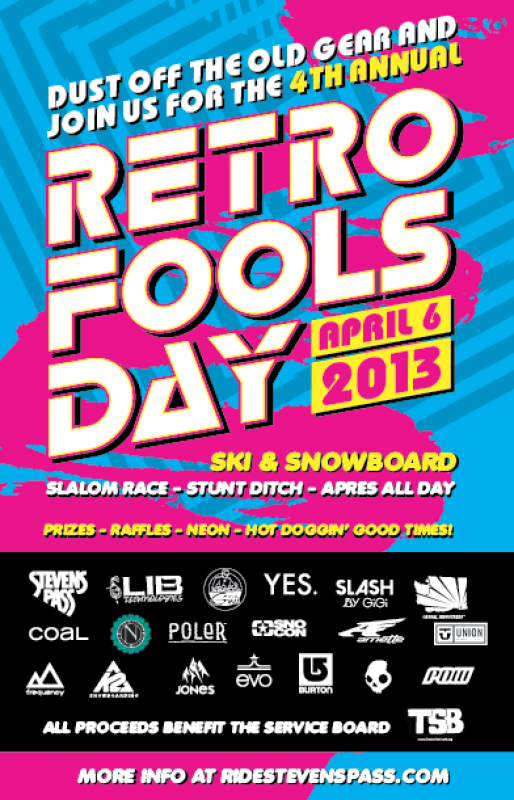 Time to bust out those old straight skis, directional snowboards, one-piece snowsuits and radical attitude for the Retro Fools Day! There will be a mega prize raffle and awards for best dressed, fastest time, best trick, and most radical. The older and more retro your gear the more style points you get in the stunt ditch and quicker time you post in the downhill slalom race. Remember that the the more retro your gear the more seconds you will get deducted from your time. If you decide to rock new gear you will be penalized with seconds being added to your time. Additional accessories such as walkman, old school googles, and fanny pack will get you bonus time deductions. Judges have final say on exact time deductions but can be bribed with cheap beer. REGISTER ONLINE HERE, and download the event waiver form HERE (under 18 must have parent signature). Registration is only $20, which includes a limited edition t-shirt and an automatic $10 donation to the Service Board! All proceeds from RFD4 will benefit the Service Board (www.theserviceboard.org), which is rad.